My husband and I recently did our taxes, and we were shocked by the amount of money we were being refunded by the government. At first we were elated because it was enough to pay off our car, so that we would now be able to live debt free. At the same time, we were kicking ourselves for not having this money available for use during the past year. Maybe you’ve had a similar experience – or the opposite (and decidedly less pleasant) one where you’ve had to pay more money in federal taxes than you expected. Regardless, the issue is the same. In both these situations, the amount of taxes being withheld from your paycheck is not coinciding with the amount of taxes that you are required to pay. The best way to fix this is to adjust your federal tax withholdings, which you can do in a few simple steps. But first, let’s look at how to decide if you need to make an adjustment. When Should You Adjust Your Tax Withholding? If you received a large tax return from the IRS for last year’s taxes, that means too much money was being taken out of your paycheck. Sure, it’s exciting to get a big check, but think of it this way: this is money that belongs to you that you were essentially loaning to the government interest-free. If you were not loaning it to the government, not only could you have used that money throughout the year to pay for your expenses, but you could also have invested it and received interest on it. It’s great when you can do something smart with your tax refund, but it is not the best financial situation. Let’s say for example that you got a refund of $1,000. You gave the government $1,000, and the government gave you back $1,000. Had your tax withholding been correct, you could have invested that $1,000 or had it available in an emergency fund instead of letting the government profit from it all year. It sure is an awful feeling when you owe a large amount of money to the government, especially if you thought you might be getting a refund. But just like with anything that you must save up for, you need to put a little extra money aside with each paycheck to pay for a big expense. On way to do that is to not have the money in your possession at all. Out of sight, out of mind. Increase your withholding so that the government gets the money before you receive it. For example, if you owe $1,000, and you get paid weekly, you can spread that $1,000 out over 52 weeks. So instead of owing the government $1,000 in one lump sum, give them an extra $20 each week to avoid owing when you file your taxes. When your life changes, so do your taxes. Did you get married? Have a baby? Buy a home? Start giving charitable contributions? Are you expecting any of these changes in the coming year? All of these things will affect your taxable income so take the opportunity to review your tax withholding and adjust accordingly. To adjust the amount of taxes withheld from your paycheck, the first step is on you, and the rest is on your employer. There are a few different methods to determine the number of withholding allowances that makes the most sense for your tax situation. Before you get started, have your previous year’s tax documents handy as well as your last pay stub. Too many of us skip right over the worksheet portion of our W-4s and go straight to the part that needs to be filled out for our employer. When I was younger, I actually had an employer tell me not to worry about the worksheet portion and to just put zero in for the number of allowances. As a result, I had far too much withheld for taxes from my paycheck. In fact, the W-4 Personal Allowance Worksheet can be very helpful, especially if you are not itemizing and only have one source of income. 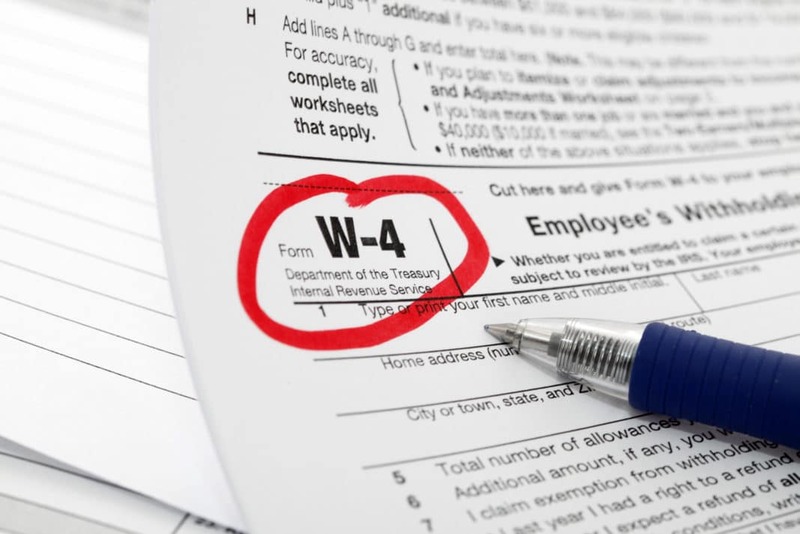 Use the IRS W-4 Form and associated worksheet as one way to determine your correct number of allowances. The IRS Withholding Calculator can be found on the IRS website and is very simple to use. To use the calculator, you need to answer a series of questions about your marital status, dependents, and income. This is where having your previous tax documents and last pay stub comes in handy. If you plan to only use one method, this is the easiest. A rough calculation that you can do is to back in to how many allowances you should have based on how much tax you expect to owe. The first step is to plug estimates in the following formula to determine your taxable income. Next, visit the IRS tax tables to determine how much you will owe for the year. Divide that number by the number of paychecks you expect to receive to determine how much you should pay in taxes per paycheck. Then meet with your payroll department to determine the number of allowances you need to make sure that amount is taken out per pay period. If you want the easiest, yet least accurate, way of calculating your withholding allowances, just count them up in your head. Count one for each person in the family, count one for owning a home, and count another one if you make charitable contributions. You can use this method as a quick gauge to see how close you are with the withholdings you currently have. Keep in mind that the higher your withholding allowances, the less tax will be withheld from your paycheck. That may seem like a good thing, but you don’t want to have too much withheld or you could be liable for an underpayment penalty when you file. Have you adjusted your tax withholding? Are you happy with the result?